Jeju Island in South Korea is one of the incredible gems of the entire planet. It is one of the ultimate destinations for aspiring digital nomads. Picture a tropical paradise, with stunning beaches, rock sculptures, restaurants, a volcano, mountains, waterfalls, and nature reserves. All within a peaceful, safe, clean and respectful Korean society. Balance this with world-leading wifi and comfortable cafes practically everywhere, with the ability to camp for free across the island. You can easily work and play from Jeju Island. In fact, we loved our two week visit on Jeju so much, we thought about one day moving here. It has changed my perspective on life, what I want to do with it, and the work I need to sustain it. 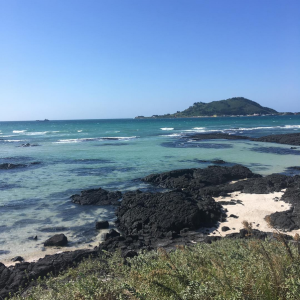 With my friend studying in Seoul on an exchange programme, we found extremely cheap flights to/ from Jeju Island, ahead of the Autumn holiday break. Approximately W25,000 / $25 each. Jeju Island is powerful and inspirational. It is a UNESCO World Heritage site, having won the organisation’s science award three times, and is considered one of the 7 next wonders of the world. One evening we spent climbing the steps of a Buddhist monastery on Mount Sanbangsan. We ascended to view the candle-lit temple carved into the volcanic rock, while the winds whopped around the mountain and sea. It was one of the most beautiful sights and moments of my life. A few levels down, on a viewpoint, we could look out to the ocean and other volcanic mountains. A bitter reminder of the creeping realities of capitalist developments encroaching on the natural wonders. If you like nature, you’ll marvel at the litany of tropical forests, waterfalls, mountains, plants and animals, and more than enough tourist-friendly attractions. The warm weather maintained in the low to high 20s (70-85 F), rarely chilly at night, and only one of the days was drenched with rain. Jeju is a tropical paradise. The excellent public transportation system includes a multitude of buses that loop, east or west, around the island. The 101 and 102 are express buses (W4,000) that loop east and west respectively, making fewer stops. The 201 and 202 are their slower siblings that stop far more frequently, for cheaper. Handy for those precise area stops. Other bus systems that loop in different directions meet up with the main circular network, including direct buses between Jeju Airport, Jeju City, and the main southern city, Seogwipo. Your T-Money card that works elsewhere in South Korea, also works on Jeju buses, and you can top up at any convenience store. Speaking of convenience stores, I’ve never seen so many anywhere in the world. They all seem to be prosperous, and you can find lots of cheap food options, like noodles, soup, burgers, pasta, pizza slices, that can be heated up with complimentary boiling water or microwaves. Alcohol is available 24/7, and Soju is the main drink – it’s like a mini vodka, available in many different flavours. It’s also the cheapest alcoholic option, around W1,500 per bottle. You can eat and drink on the picnic tables usually found outside each convenience store. Most nights, we camped for free all over the island with no problems whatsoever. There is a spot near the airport we learned about. We stayed there for our first evening on the island, close to a fun walk exploring the northern limits of Jeju City. The next two nights we stayed at Gwakji Beach, where other tents were set up. These tents aided our nerves about simply popping up our tent in public view. We were extremely fortunate and endlessly grateful to meet a long term resident of Jeju. He is an American professor and hiking/surfing/camping enthusiast. He showed us numerous incredible camping spots, in parks, and – one we stayed at for three glorious nights – off the beaten path. This was under a gazebo on a rocky beach near caves that tourists simply couldn’t discover. On the first Tuesday, we missed our flight. Perhaps willingly subconsciously delaying our return to Seoul – after an emotional, powerful evening and morning where we were in no state to fly. That night I found a deal at a hotel called Kkodak Kkodak Guesthouse in Seogwipo on booking.com for W30,000. After a week sleeping on various surfaces that included rocks, we craved a real bed and shower. The night was a lot of fun, with a nice market nearby. Our final five nights were spent near Hallim, beside Hyeopjae Beach. 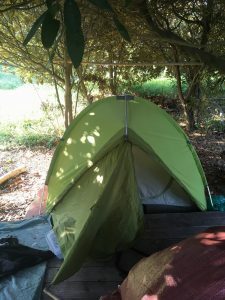 Our tent was set up in a secluded little area surrounded by trees, raised on a deck. 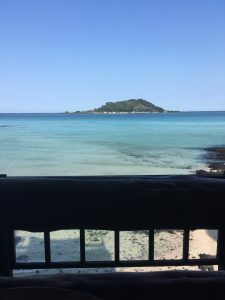 We enjoyed the beach, warmed into a routine of waking at a reasonable time to work from cafes from morning through the afternoon, walked a lot, and explored the area at night. One night’s dinner at Container Yard introduced us to the owner. Rain is a prominent South Korean film director, who later took us out, and welcomed us to his home. On some nights we saved money by eating delicious burgers and noodles from convenience stores, while treating ourselves to the best pizza in the country at Donato’s. So, you can work with the best wifi in the world, enjoy coffee and incredible food at all price points just about anywhere. Travel around the island easily. Save money by camping for free in forests or by beaches. Indulge in a nice hotel when you need one. Inspire yourself from some of the greatest natural attractions on the planet. Enjoy a stellar, fun, romantic tropical island in a safe, respectful society. What more could anybody want? Jeju Island has it all. I truly felt like I was living the dream. South Korea is so advanced for wifi that you don’t need a SIM card. I suppose a SIM and data plan would be handy when working from outside, or at a location without buying a drink to feel welcome. 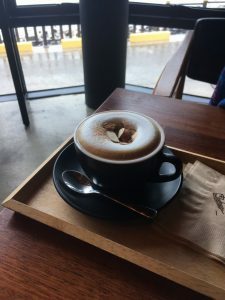 I’ve never been rushed out of any venue in Korea – even later the evening after buying one coffee in the morning. 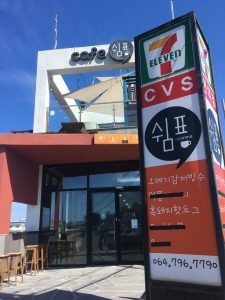 There are Wifi enabled coffeeshops on Jeju Island everywhere. Jeju itself is so well connected, that your devices will automatically pick up one of the regular wifi connections. This includes Jeju Free Wifi, iptime, KT Free Wifi (particularly on buses), and any of the chains of cafes. Hence, it makes plugging in for an hour or day of work a breeze, which you can enjoy by taking in stunning views in sublime weather. Check out my current view right now. If you come to Jeju I imagine you will visit Hallim and Hyeopjae. An incomparable white sands beach with layers of different bright and deep blues, into the blues of the sky. It is stunning. It’s also a popular tourist area, that isn’t as overbearing as you might imagine, even on balmy days. 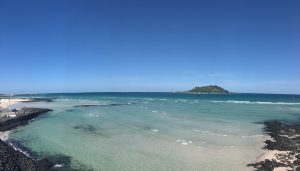 You can escape the crowds by walking a few minutes to adjacent beaches. Caffe Bene – Set in an historic old building on top of the main beach of Hallim. The view is excellent, the vibe is comfortable for working, and the drinks are excellent. You’re looking in the W5000-6000 range for most coffees, juices and teas. Opens from 9am. Paris Baguette – A hugely popular chain across South Korea, Paris Baguette features the cheapest coffees of this group of coffee shops (W3000 for a cappuccino). It’s difference maker is the quality, in-house baked goodies and treats. The other main draw card is that in the Hallim beach area, it is the first to open, at 7am. Comma – Three levels of the absolute greatest views of the ocean, rocks, sky and neighbouring island. Coffees include the silky smooth Sweet Potato Latte and Green Tea Latte (W5,500). Free hot water machine for refills. Open deck, chill out lounge on second level, or the quieter main level with good work bench areas. Note that as of writing the wifi is strong only on the first level, and doesn’t connect from the roof. All three levels feature stunning views. Opens from 9:30am. Datstar Geumneung – Perhaps the best coffee I’ve enjoyed in South Korea – and the first Melbourne-level coffee I’ve uncovered since Europe. Sweeping views from adjacent Geumneung Beach, perfect for the stormy Sunday we worked to escape the first, non-stop torrential rain of this trip. While you can eat fairy well and inexpensively at the multitude of convenience stores, once in a while you may like to treat yourself. Jeju Island features no shortage of quality, top level restaurants, at roughly European price levels. One night late out in the Gwakji area, following the random launch party crashing of the new Jeju line of Soju drinks, we were hungry, and everything was closed. 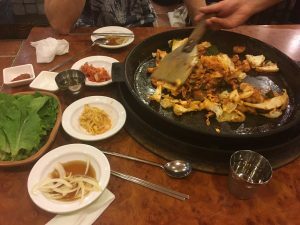 We treated ourselves to a traditional Korean restaurant, where they cook your selected items on a hot plate on your table. We ordered two different types of meat for W15,000 each, and were served unlimited free refills of tasty sides. They even let us drink our own soju! We found a quiet gem in Jungmun – Fried chicken and beer – W7000 for a whole chicken, and the same for 2 beers, while Korean baseball played on the TV screen. On a recommendation, one night in Seogwipo we ate at a tasty chicken joint, featuring the same Korean style table cooking. We enjoyed two types of chicken and an assortment of unlimited vegetables, for W30,000. Perhaps the best taste of our entire time together came in Hallim. 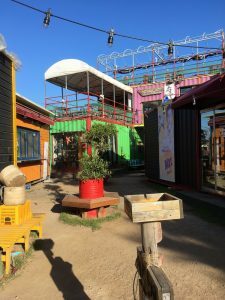 A quirky location of a set of shipping containers create a mini atrium of shops, a cafe, and a rooftop restaurant – called Container Yard. We met the owner and chef for a run through of their short but sumptuous menu, and decided on a plate of the grilled sea eel (W17,000). When it arrived, with layers of Korean lettuce, the BBQ sauce and grilled eel combination was mindblowingly delicious – we couldn’t believe it. We gobbled it down with a few local draught beers (W4000 each). After dinner, we chatted with the owner, and he took us out to a local’s bar around the corner. Craving pizza the whole trip, we found what was reputed to be possibly the best pizza in all of Korea. Some Italian reviews even say “in the world”! We decided to check out Donatos in Hallim, tucked away a block from the main strip, near the beach. The Vegetariana pizza with extra Gorgonzola and sheep’s milk mozzarella (W24,000) was indeed one of the most delicious pizzas I have eaten anywhere. Its hot, cheesy crust was complemented by a fresh, tasty chicken Caesar salad (W15,000), and two glasses of terrific house red (W7,000 per glass). Alternately, corkage is W5,000 if you bring your own bottle. It was by far the most expensive meal of our trip, but absolutely worth it. The day after lavish nights out we would try to save money by eating convenience store noodles (W1,200-1,600) or surprisingly tasty burgers (around W2,200). There is great variety and range of options. You can travel by plane from mainland Korea, China and Japan, on one of many different airlines. One way flights to/from Seoul can be found for as low as W10,000. Our flights were purchased on T’Way and Jeju Air for around W25,000. Note that during peak seasons, flights become considerably more expensive, if you can find flights at all. For instance, after we missed our return flight, most flights between September 27 and October 10 were sold out. The rare ones available as high as W550,000 – for the cheapest on a busy day. It was simply not an option for us, so we planned our return via ferry. Traveling to Jeju by ferry is also a popular, affordable option. You can reach Jeju from main Korean ports Busan, Wando, Mokpo, Haenam, Goheung, and Yeosu. Our 3rd class ferry from Jeju to Yeosu cost us around W38,000 each, though it’s cheaper if you book sooner and not within peak season. Writing this article has reiterated what a special time Jeju Island has been to our lives. It’s a place I plan to return to in the future. Perhaps for an extended amount of time. Jeju has everything you could want or need. 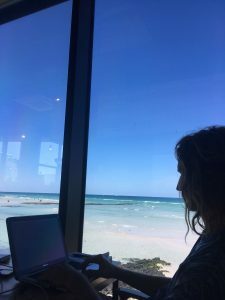 I you’re a fan of working near beaches in warm weather, good food, and inspiring surroundings, it is one of the greatest digital nomad destinations on the planet. Daily budget: W10,000-15,000, if free camping. That’s $10-15 a day.